Globally, governments, development agencies, and inter-governmental institutions have invested heavily in skills-building interventions seeking to enhance the employability of youths. However, policy actors are becoming more aware of the shortcomings of skills-building interventions, and attention is shifting to focus on how to promote productivity, boost the private sector, and generate the kind of growth that could create jobs. While policymakers have endorsed the role of the private sector as a job generator, it remains unclear whether, and under what conditions, the formal private sector generates enough and decent jobs. Empirical research on youth employment in the private sector is sparse. This IDS Bulletin begins to fill that gap. The articles here have been authored by young African scholars from the Matasa Fellows Network, convened by the Institute of Development Studies (IDS) in collaboration with Mastercard Foundation. These early-career academics from Ethiopia, Ghana, Kenya, Nigeria, Uganda, and Zimbabwe were selected to consider the role that could be played by the formal private sector in job creation in Africa. Case studies come from their respective countries. While some aspects of the youth employment challenge are common to all six countries, the local contexts and situations are unique and sectoral. 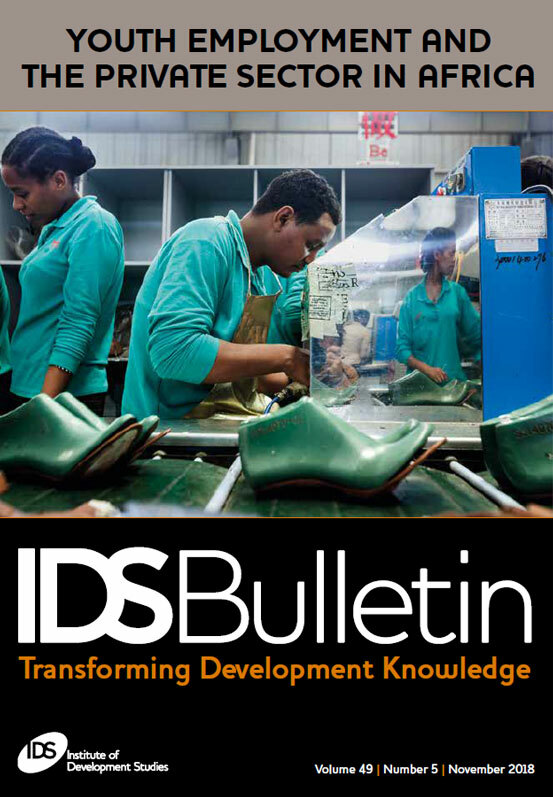 This IDS Bulletin explores the scope of research and policy challenges in three specific areas: agribusiness and youth employment; skills gaps and youth employability; and youth employment in fragile and conflict-affected settings. The articles demonstrate the importance of effective policy measures to ensure that private sector growth creates sufficient numbers of decent, secure jobs to provide employment to African youth. Integrated development projects seem to have largely fallen out of favour since their heyday in the 1970s and 1980s. Integrated projects are by their nature often complex and messy – and this has thrown up challenges for researchers and evaluators attempting to assess the benefits of simultaneous implementation. 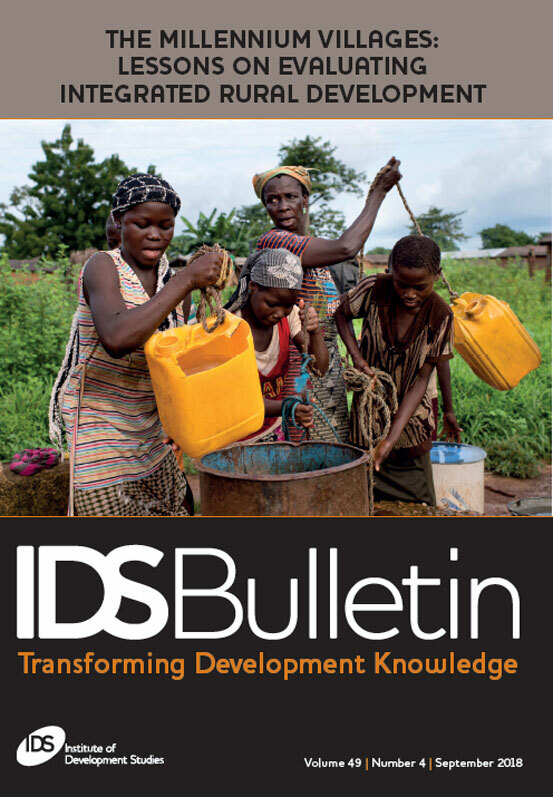 This IDS Bulletin explores recent evidence on integrated approaches in rural development. One of the observations in writing this IDS Bulletin, is how much the evidence base has improved, and there is now a greater understanding of where knowledge gaps exist. 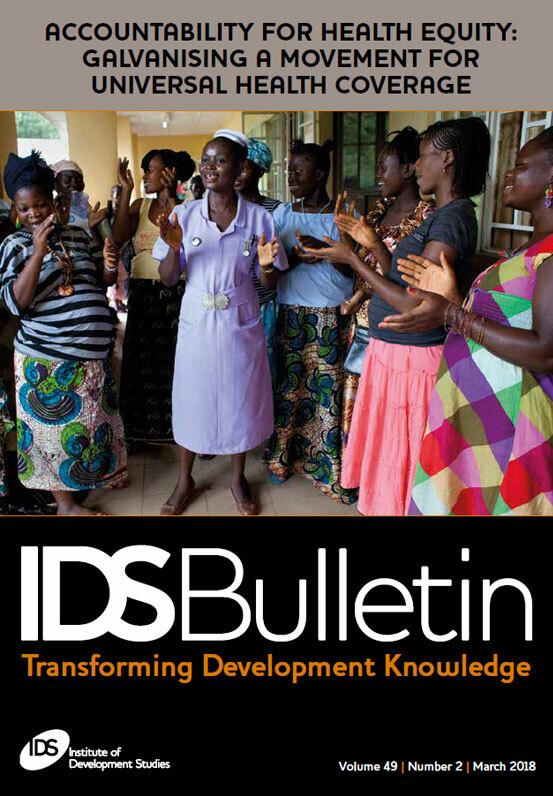 Amongst other examples, this IDS Bulletin looks at lessons from evaluating the Millennium Villages Project (MVP) in northern Ghana. The MVP was initiated in 2005 to implement the previous Millennium Development Goals (MDGs) in rural villages in sub-Saharan Africa. The MVP is seen as being one of the most prominent examples of integrated development in recent years, with new evidence now emerging about its effectiveness. Meanwhile, there is a renewed interest in interconnectedness, including finding ways that work across different sectors in order to implement the current Sustainable Development Goals (SDGs). Inherent in the SDGs is the recognition that the goals are interdependent, although it is noted in the articles here how integrated development approaches have yet to resonate fully with the SDG agenda. The articles are deliberately diverse, covering everything from systematic reviews to randomised trials, to mixed method designs and immersion approaches. When reviewed together, they highlight several reoccurring themes, including: the challenge of assessing synergy effects; the cost-effectiveness of integration; the value of mixing methods; and dealing with multiple outcomes on different timelines. Almost two decades have passed since ‘emerging donors’– new providers of development cooperation – began to attract the attention of ‘traditional donors'. Comprehensive comparisons of the various features of different types of donors have thus been elaborated on as their economic and political roles have solidified. Subsequently, the focus has also expanded to cover the growing significance of cooperation between ‘new donors’ themselves, beyond high-profile groups such as the BRICS (Brazil, Russia, India, China, and South Africa). 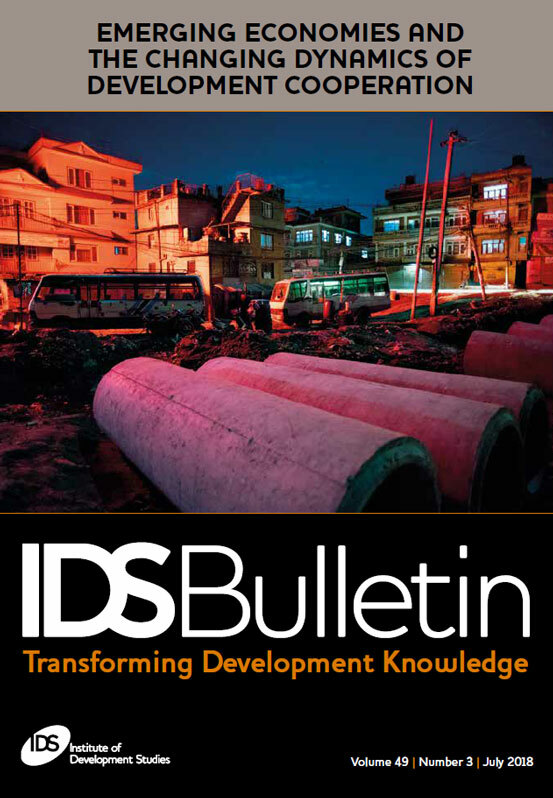 This issue of the IDS Bulletin is a collaboration between the Japan International Cooperation Agency (JICA) Research Institute and the Institute of Development Studies (IDS). The studies are dedicated to highlighting the actual and potential contribution of a wider range of donors, and are intended to help compensate for imbalances in existing literature, contribute to scholarly understanding, and offer informative insights for practical policy deliberation. More fundamentally, this issue questions the explicit and implicit underlying assumptions in examining the issue of development cooperation: namely, the dichotomy of ‘traditional’ and ‘emerging’ donors. The subjects covered in the various articles range from exploring the importance of knowledge in the development cooperation experience of emerging economies; the challenges involved in the policy formulation and implementation of triangular cooperation within a sometimes contradictory set of processes embedded in South–South cooperation; the dynamics of ‘two-way interaction’ between donors and recipients in chains of knowledge creation; and there is an important reassessment of the critical data upon which estimates of China’s foreign aid disbursements are made and understood in international comparison. Since the publication of the 2004 World Development Report, a range of different attempts have been made to make the design, prioritisation and delivery of health services more accountable to different stakeholders. However, complex politics and power dynamics can limit or skew people’s abilities to access services or hold them to account, particularly for poor and marginalized people. In July 2017, the IDS hosted a workshop in collaboration with Future Health Systems, the Impact Initiative, the Open Society Foundations, Unequal Voices, and Health Systems Global, to develop new thinking and practical approaches to improving accountability relationships and processes in favour of greater health equity. This new issue of the IDS Bulletin focusses on three principal themes that emerged from this workshop as needing particular attention. First, the nature of accountability politics ‘in time’ and the importance of longitudinal approaches to change. Second, the contested politics of ‘naming’ and measuring accountability, and the intersecting dimensions of marginalisation and exclusion that are missing from current debates. Third, the shifting nature of power in global health and new configurations of health actors, social contracts, and the role of technology. For the first time in IDS Bulletin history, themes are explored not only in text but also through multimedia contributions. This expansion into other forms of communication is explicitly aimed at galvanising larger numbers of people in a movement towards Universal Health Coverage (UHC) and the linked agenda of accountability for health equity. The content of this issue reflects the fact that while the desired outcome might be the same – better health for all – accountability strategies are as diverse as the contexts in which they have developed. 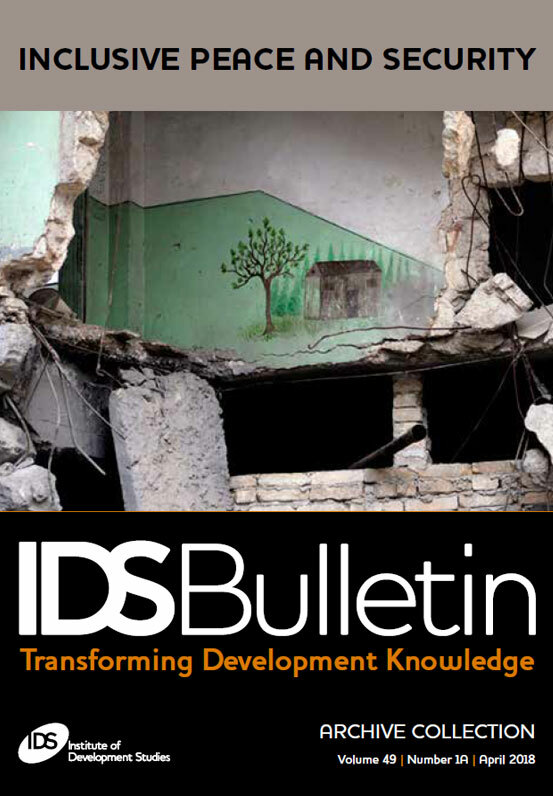 This IDS Bulletin Archive Collection reviews four decades of analysis and research on peace, security, and development, drawing on articles published in previous issues of the Bulletin throughout this timeframe. IDS first began to investigate the relationship between disarmament and development in the 1970s. Then, research focused initially on disarmament and its actual and potential contributions to development. Disarmament, along with reductions in military spending, it was argued, would release resources for development. It would also break the cycles of militarisation which propelled violent conflicts in many parts of the developing world. After the end of the Cold War, development research engaged more and more directly with conflict prevention and peace-building. The focus then turned towards security in a global context, in which donor agencies involved themselves directly with security questions. As shown by the articles in this edition, work at IDS has been distinctive in three respects: first, in interrogating the multiple meanings and forms of security – international, national, military, personal, livelihood, food, environmental, etc. – and how these interconnect, or indeed clash; second, in tracing the complex links between global, national, local, and personal security; and third, in its insistence that security be inclusive, drawing upon the experience and agency of the people and groups who are ‘developed’ and ‘secured’. The pieces reprinted in this Archive Collection help analyse shifts in focus over the four decades, before highlighting that it may be time to revisit disarmament, as a tangible policy goal, in these present times of chronic insecurity and increasing violence.